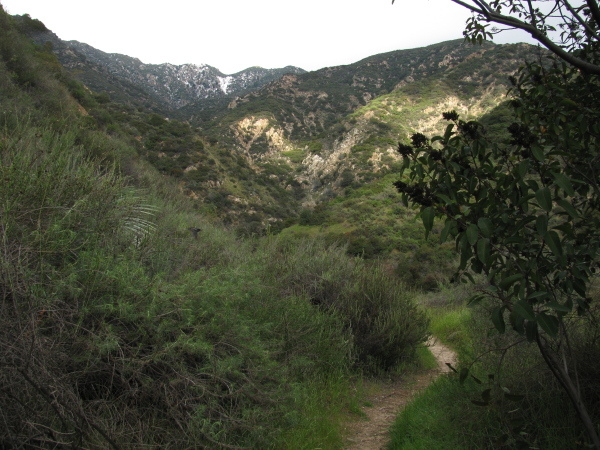 Another look up Rubio Canyon. A stark difference in vegetation when the fire road works as a fire break at the edge of the Station Fire. 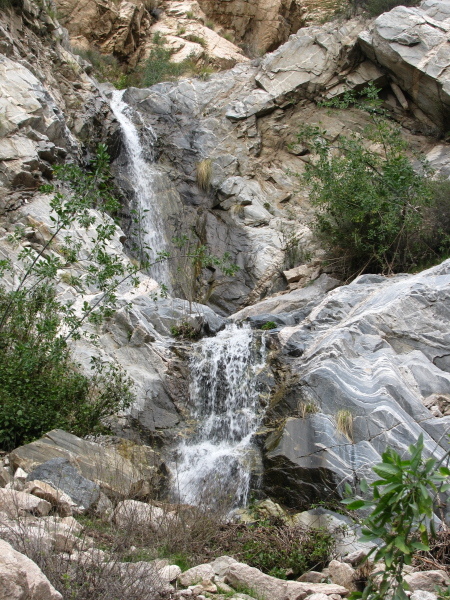 I noticed that Millard Canyon was open in the latest map of the forest closure due to the Station Fire, and since I think that falls is the best of the little falls you can get to easily in the very local backcountry, I decided to go see it. It's been raining even more since last weekend and so sunny this weekend. The canyon was very frosty and there's still snow on the high reaches. When I got to the trail, it had a fence across it, the creek, the back of the campground host, and up the other side of the creek. There are signs saying it's closed and one implying they're video taping for good measure. Guess I should have squinted more closely at the map because just the campground is open. I stopped at the top of the canyon where Sunset Ridge hits the road and walked out along it instead. This has been the boundary of the closed area from the beginning, so I was not worried it wouldn't be open. 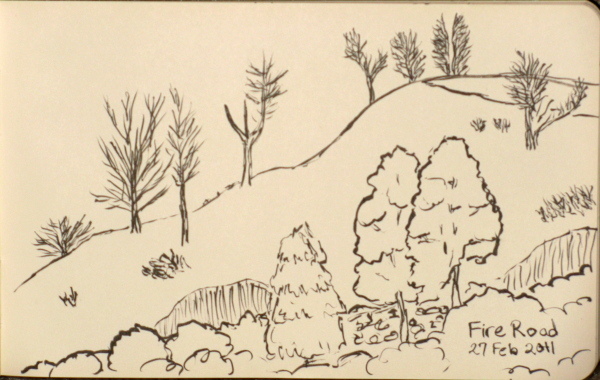 I sketched one of the hillsides along the road. The edge of fire is marked by the road that blocked its progress. Looking up along there, the road is unseen. Only a cut here and there in the hillside and a line of bush mark where it is. Both sides of the road are green today, but the far side is only green from grasses and low things while the near side is many shades of green that stand high above the ground. Here, the fire road blocked the spread of fire. 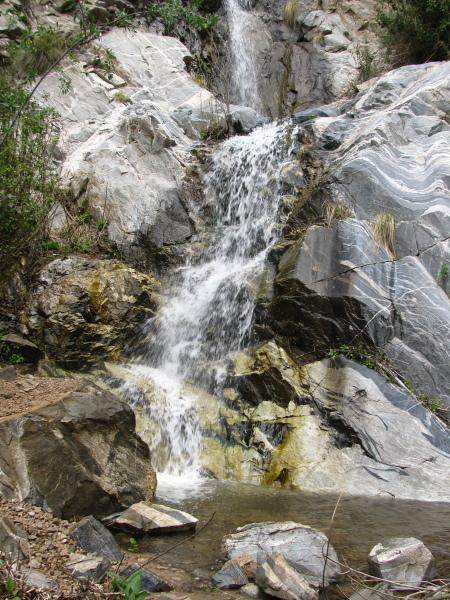 Decided I would go up and see if the falls up Rubio Canyon were any larger than seen before. Didn't really expect it, but it could be, there's been a fair amount of rain. I think it was a little bit more than seen before, but not by much. 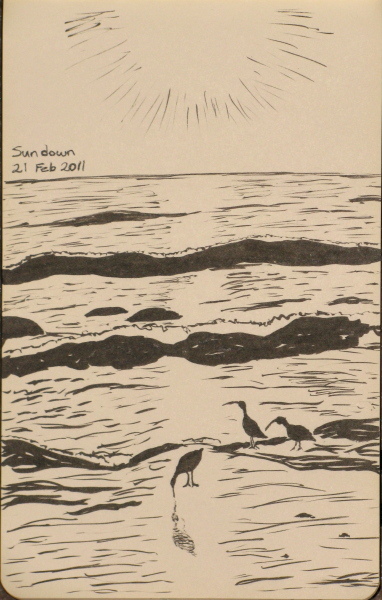 The last few days have started off sunny, but then clouded over and started with a very solid bit of raining. It's also quite cold, which must be why the snow was so very low down. It was quite noticeable while driving up that the burned bits had a new layer of white. I thought about going up the other trail, but it didn't look like it would go high enough to poke at the snow. The trail ahead and the snow looming in the higher reaches where the trail does not go. There's a few tough spots as the trail winds up the creek bed after the ruins of the pavilion, but it's starting to look like there really is a trail up there in most places. It also looks like someone has been hacking some of the growth down, especially a few bushes that obscure the falls once one gets up there. Coming upon the falls: Moss Grotto and Ribbon Rock. 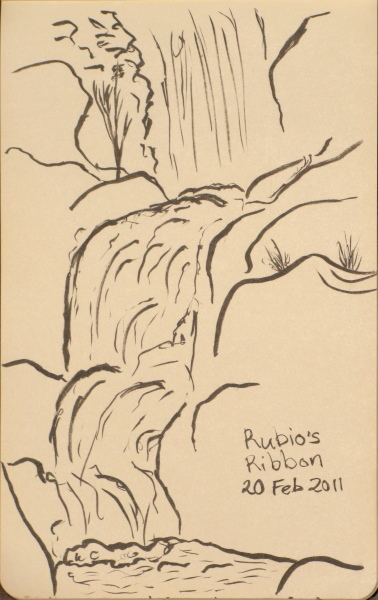 I decided to draw the lower falls, although it's somewhat hard to find a good sitting space for it. I think I did find something suitable. As I started, the clouds started rolling in. I felt a big drop, but decided to blame it on the falls. Closer and not so far below the falls. 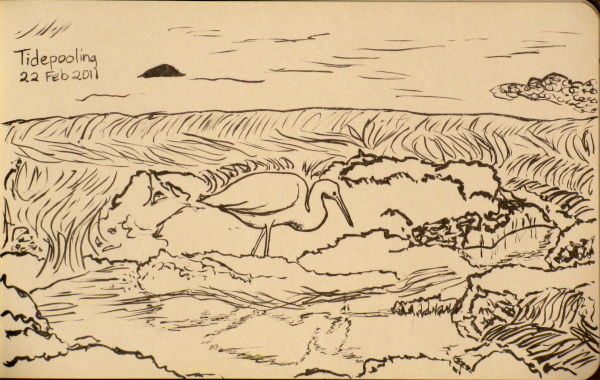 The sketch produced sitting on a rock below the water fall. No further drops fell while sketching, but the clouds got thicker and seemed somewhat threatening. I packed up and took off back down the canyon. Along the way, I noticed that the trail down the incline that the ruins mark the bottom of is getting more and more defined, although I didn't actually hear anyone coming down it this time. 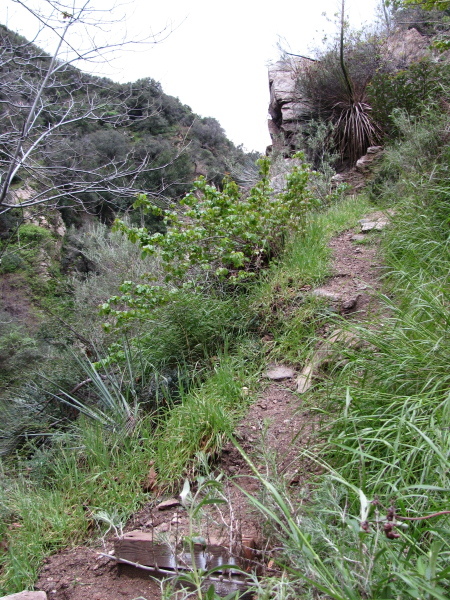 The bottom of the trail that follows the path of the incline railroad that once passed between Rubio Canyon and Echo Mountain. I finished up uneventfully without dodging rain drops. A couple who had come just far enough to see the falls around the corner were headed back and a fellow with a fairly large child for carrying on his back seemed to have turned back, so it seemed people were deciding the hiking was done for the day, but there turned out to be one pair starting out in spite of the threatening clouds. There were a few coming back as I went out too, so there was quite a bit of traffic today.